In medium bowl, cream together butter and confectioner's sugar. Add strawberries. Mix well. Serve with Strawberry Cream Cheese Muffins or bagels. 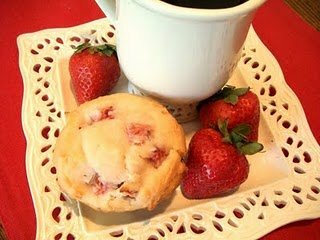 My husband's new favorite muffins are Strawberry Cream Cheese Muffins. When I first made them, he kept saying he would love to have some of that butter with the strawberries in it to go with them. I thought it might be a little too much. 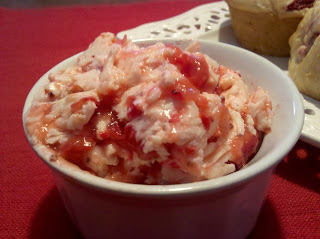 But I love him, so I made up a batch of my Strawberry Butter. He was right! It was the perfect addition to the muffins. Not too sweet, just creamy and rich. Preheat oven to 350 degrees. In large bowl, combine cream cheese, butter, and sugar. Mix well. Add egg, milk, and vanilla. Mix well. Add Bisquick. Mix until just combined. Do not over mix. Fill greased muffin pan cups 3/4 full with batter. Bake 30 to 35 minutes or until lightly golden brown. Makes 12 to 14 muffins. I seldom make a recipe the same way twice. The first time I made this recipe I followed Bo's Strawberry Cream Cheese Muffin recipe. It was absolutely delicious! 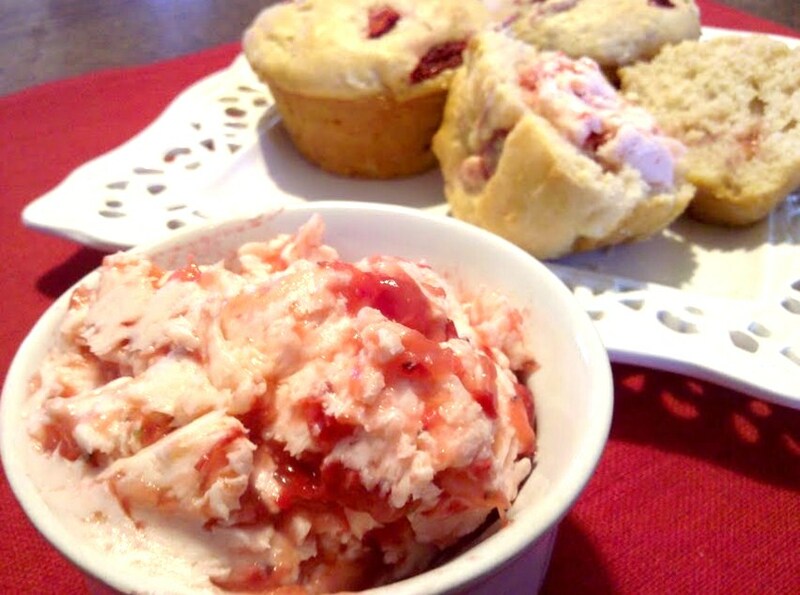 The muffins have a delicate texture with chunks of fresh strawberries through out. The second time I made it, I decided to change it a little bit. 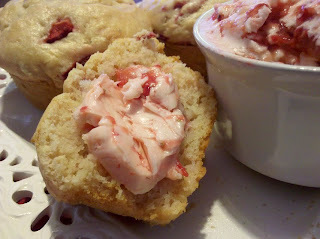 I swapped out the cream cheese for strawberry cream cheese and made a few other changes. My family loved the muffins both ways. I will be making these muffins again and when I do, I am sure I will have a new way I will want to make them. Do you follow recipes exactly the way they are written or do you like to put your own twist on them? Strawberries are my favorite fruit! And apparently I am not the only one who feels that way. Ninety four percent of US households consume strawberries. When I bring strawberries home from the grocery store or the Farmers Market, I do not wash them until I am ready to consume them. Strawberries don't last very long when stored in the refrigerator, so I try to consume fresh strawberries within 2 to 3 days of bringing them home. If I am unable to eat all of the strawberries I purchased, I will freeze them. To freeze the strawberries, I wash, hull, and dry them, then I arrange them in a single layer on a baking sheet and place it in the freezer. After they are frozen, I place them in a resealable plastic freezer bag. By doing this, I always have strawberries on hand when I want to make my Grilled Strawberry Shortcake recipe. Preheat oven to 350 degrees. In 13x9 inch baking pan, sprayed with cooking spray, arrange marshmallow in the bottom. Prepare cake according to package directions. spread cake batter over marshmallows. Spoon apple pie filling on top. Bake 50 to 55 minutes. Serve with whipped topping. 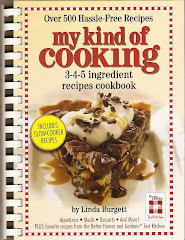 When people know you write cookbooks, they will often share one of their favorite recipe with you. That is how this delicious cake recipe came to be in my kitchen. Before I put a recipe in one of my cookbooks I always try it first. This cake made it into the, MY KIND OF COOKING COOKBOOK. The cake is very moist and full of flavor. This is a fun cake for kids to help make. It is almost like a magic trick. You put the marshmallows on the bottom of the pan and the apple pie filling on the top and as it bakes they switch places! Just make sure the kids know the marshmallows will heat up and melt when they make there way to the top. You don't want your kids to be disappointed like my niece was. She thought the marshmallows would come to the top and toast like a marshmallow over the fire. The disappointment turned in to happiness with her first bite of the cake. I love doing cooking demos. Just like everyone else, my life is very busy. Outside of the days that I schedule to test and create recipes, I do not have hours to spend in the kitchen. 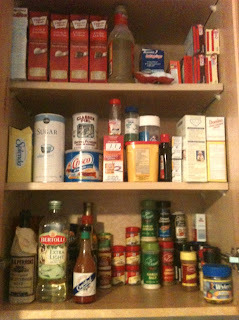 The tips below, help me to make the most of the time I do have in the kitchen. 1. 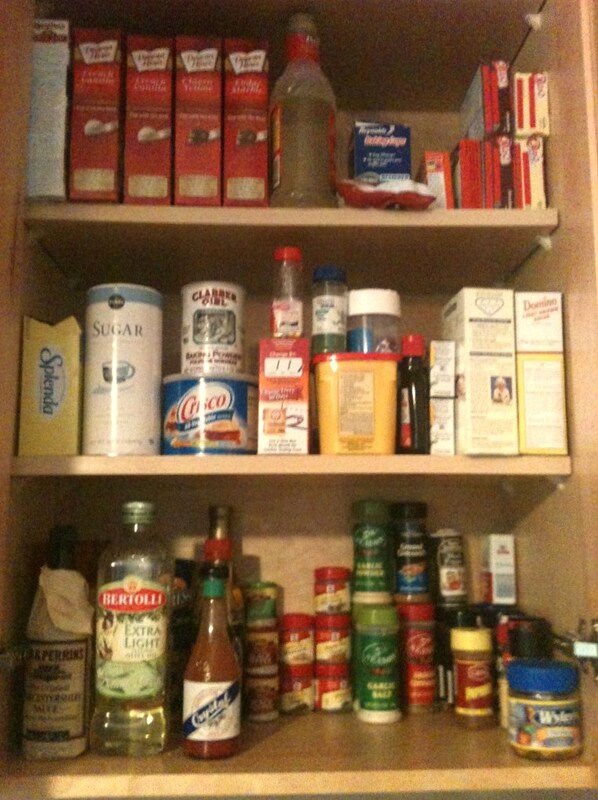 Organize your cabinets. If you have to search for an ingredient or dish, you are wasting time. Get rid of items that you don't use. If you feel like you can't part with anything. Put items that you haven't used in a long time, in a box and place the box in another room. 2. Always read through a recipe before you get ready to cook it. Check and make sure you have the ingredients that are required to make the recipe. 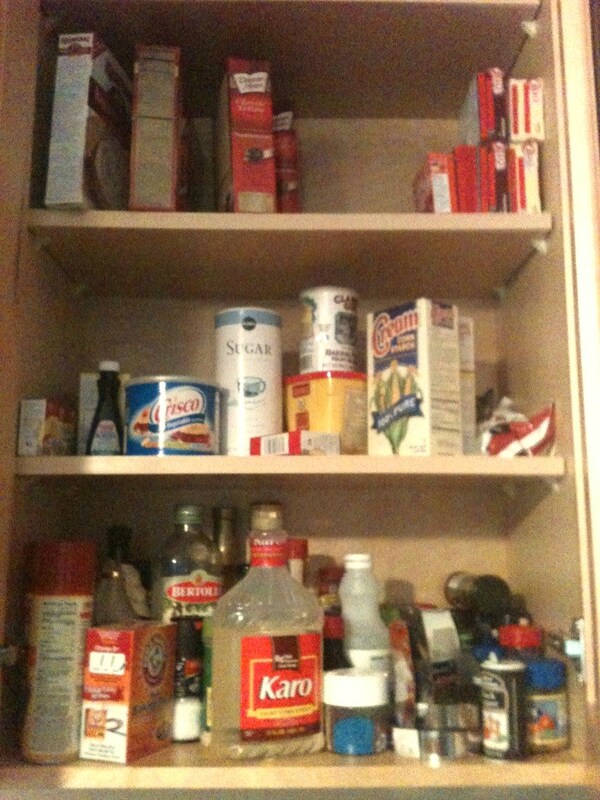 It seems I always have to make a run to the store for ingredients that I was SURE I had in the cabinet. 3. Gather all ingredients and tools needed to make the recipe. Put them away as they are used. 4. As my Mom always says, "Clean as you go". Fill the sink with soapy dishwater and wash the pans and tools when you finish using them, or place them in the dishwasher. My niece Miley, loves to help in the kitchen! 5. Cook together. The family that cooks together, stays together. 6. Use shortcut ingredients such as: Bagged lettuce, frozen cut vegetables, pre-cut fresh vegetables, refrigerated dough, jarred sauces, etc. and cut up and prep ingredients ahead of time. I clean and chop fresh ingredients when I bring them home, so they are ready to use in recipes. 7. Use your slow cooker. It does the cooking while you are gone. You come home to a delicious home cooked meal. 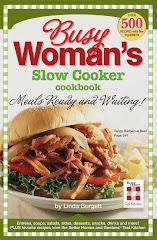 I use my slow cooker more in the summer than I do in the winter. It cooks without making your house hot. I make desserts, vegetables, and side dishes, to go along with whatever I am grilling. 8. Use a kitchen timer. 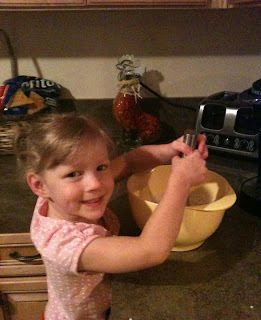 It is very easy for me to get distracted when I cook and the timer has saved a meal or two at my house. 9. Pick recipes that have just a few ingredients. I am always on the look out for cooking tips! What are your favorite kitchen tips? Mushrooms; you either love them or hate them. You can put me and my family in the love mushrooms column! I am in good company in that column; Ancient Egyptians believed mushrooms were a plant of immortality. The Pharaohs classified them as royal food and commoners were forbidden to even to touch them. The Pharaohs may have been on to something. Mushrooms are high in B vitamins and minerals. On top of that, they are low in calories. Just more reasons for me to love them! The Button Mushroom is the most popular mushroom in the United States. More than 90% of the mushrooms purchased in the US are the Button Mushroom. 1. Mushrooms will last longer if you store them in a paper bags in the crisper compartment of the refrigerator. 2. For the best flavor: Sauté mushrooms on low to medium heat. 3. For the best texture: Sauté mushrooms on high heat. 4. Only clean mushrooms when you are ready to us them. Gently wipe mushrooms with a damp cloth or paper towel or clean them the good old fashioned way, by running them under cold water. 5. Dried mushrooms: Soak dried mushrooms in hot water for 30 to 60 minutes. Rinse and chop. Save the soaking liquid to add to soups and sauces. I use dried mushrooms more like a seasoning than a vegetable. 6. You can freeze cooked mushrooms, but not raw ones. Frozen mushrooms will last several months. I buy my mushrooms at the grocery store. I never go mushroom hunting. I am too afraid to pick a poisonous one. The cause of that fear was a movie I saw when I was a teenager. I don't remember the name of the movie, but I remember the story. A group of women killed a man with a soup made with poisonous mushrooms. I think it may have scared me for life! Do you love or hate mushrooms? Have you ever gone mushroom hunting? Preheat oven to 350 degrees. In large saucepan filled 2/3 full with water, bring to a boil over high heat. Add noodles. Boil 5 minutes. Drain. Add noodles back into pan. Add cream of mushroom soup, sour cream, tuna, and milk. Salt and pepper to taste. Mix well. Pour into 13 X 9 inch baking pan. Sprinkle potato chips over top. Bake 30 minutes. Makes 8 servings. I think everyone has their own version of Tuna Noodle Casserole. I seldom cook this recipe the same way twice in a row. Sometimes I add peas, or mushrooms, or I will change what topping I put on it. For this casserole I kept it basic so our foreign exchange students can make it when they go home. Mine, one of our foreign exchange daughters. Mine (from Bangkok) loves to cook! She used the above recipe and made the whole dinner for us by herself. Both Mine and Miki (from Hong Kong) loved the Tuna Noodle Casserole. They even had it for breakfast the next morning. How do you make your Tuna Noodle Casserole? My family loves eggs. We consumed them even when they were on the "Bad" food list. Now that eggs are on the "Good" list again, we can eat eggs without feeling judged by the food police. Cooking more eggs means there are more chances for me to drop one or two. I really try hard not to, but some how I am always making a mess in the kitchen. Eggs make a big mess when dropped on the floor. One morning as I was fixing breakfast, my Mom called. I dropped an egg and complained to my Mom about how hard it was to clean up egg from the floor. She told me to sprinkle about 3 tablespoons of salt over the egg and let it set for a couple of minutes, then whipping it up will be easier. I always do what my Mom tells me (well not always, but don't tell her that), so I followed her directions. It was amazing! Instead of the slimy egg moving all over the floor, I was able to wipe it up easily. Unfortunately, I have used this tip several times since that phone call. I won a giveaway on, From Granny's Kitchen. Please stop by her wonderful blog.